To evaluate the efficacy of the PA101D and PA201D on neutralizing airborne bacteria. The device was tested against aerosolized Staphylococcus epidermidis bacteria. A large sealed aerosol test chamber was used to replicate a potentially contaminated room environment. The chamber was equipped with a PA101D or PA201D unit, filtered HEPA inlets, digital internal temperature and humidity monitor, external humidifiers, lighting system, multiple sampling ports, aerosol mixing fans, and an HEPA filtered exhaust system. 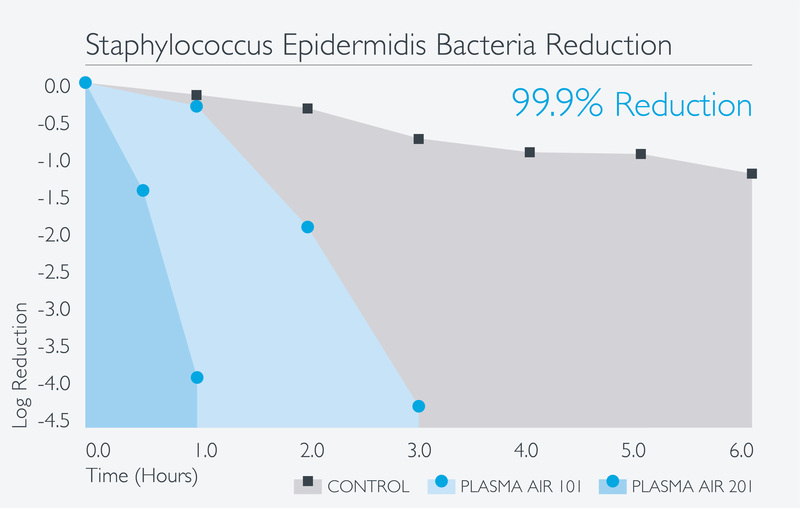 The 101D achieved a 3.4 net log reduction and the 201D achieved a 3.5 net log reduction of Staphylococcus epidermidis bacteria in 3 hours.